Knackered. It has just taken me four hours to get Piglet to sleep. According to everyone in my NCT class, their babies now sleep from about 8-9pm and wake up an average of once per night. Piglet goes to bed at variable times, but rarely before 11pm, and wakes up an average of three times. This didn’t bother me-I generally catch up on sleep in the mornings by ignoring Piglet until at least 11am-until I heard that people in my NCT class were having wild times, drinking wine, watching television and painting their nails, AFTER their babies had gone to bed. So I decided I wanted some of this unbridled hedonism for myself, especially since I have read repeatedly on the Internets that one must train babies to go to sleep on their own, otherwise one ends up with an eighteen year old who wants to be rocked to sleep every night and share the parental bed. To this end, I decided to start Piglet’s bedtime routine at 7.30pm tonight, as there was nothing on TV, so I bathed Piglet, considered reading him a story but vetoed this idea as he doesn’t appear to show any interest in books just yet, attempted to get him to watch In the Night Garden as I had heard it has a hypnotic effect on all children and sends them to sleep-only to discover that In the Night Garden finished forty minutes ago, thus proving my point that Piglet is going to bed far too late-put him in his sleepsuit, fed him, cuddled him and then put him in his cot and walked off. Those exact actions were then repeated an infinite number of times (minus the bath), to no avail. Eventually I phoned my mother in desperation, explaining that Piglet would not go to sleep and was shouting at me in baby-language from his cot, reproaching me for being a terrible mother and-to my horror and distress-probably learning from experience that his cries were not being heard and that his emotions do not matter. The latter is something that I have read on the Internet and in many baby books is the result of leaving babies to cry. And even though Piglet was not at this point crying, merely making random noises, I figured that I was already in a precarious position having spent most of the afternoon ignoring Piglet in favour of perusing various online shopping emporiums for something resembling this beauteous coat, but costing about a thousandth of the price (and I mean that literally. This coat costs £7000. 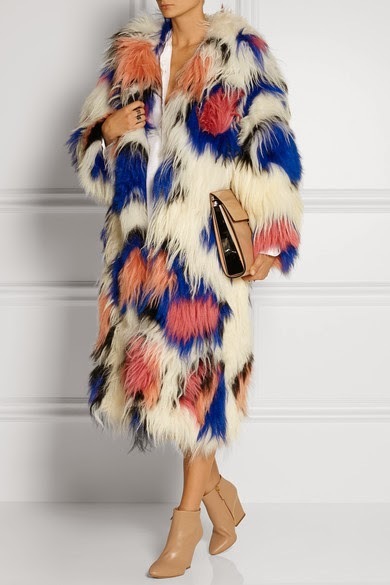 Cue lottery-win fantasies about how I would swan around on my yacht/sleigh in this fabulous coat, looking nothing like an extra from Sesame Street). I mean, is this not the greatest coat you’ve ever seen? I think we can now conclude that Piglet has definitely had his retribution for the coat-hunting, ignoring baby scenario. And hopefully the lesson we have all learnt from this is that Mummy cannot afford the £7000 coat, and already has a considerable collection of fur coats, and not that fur coats stand above Piglet in the pecking order. He is slightly above even this fabulous creation. Next Post Piglet is ten weeks old, and I find myself asking the question, how much TV is too much? I feel your pain. Mine is better now, but he used to be awake seemingly 24/7.